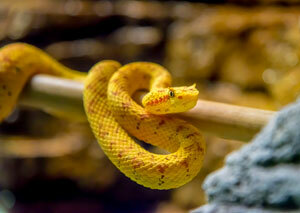 The Milwaukee County Zoo welcomes three eyelash vipers to the Aquatic and Reptile Center. One viper arrived from Albuquerque Bio Park, while the two others from Audubon Zoo in New Orleans. 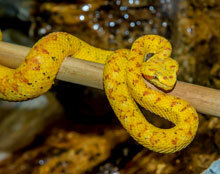 The eyelash viper is a venomous snake found in Central America and northern South America. The viper possesses pits, heat sensitive organs, on either side of its head. The pit organs allow the snake to find prey by sensing their body heat. All three of the Zoo’s eyelash vipers are female, and named after mascara brands. Their names are Maybelline, Loreal and Rimmel London. This is the first time the Milwaukee County Zoo has displayed this species. Two of the females are 3 years old and the other snake is 11 years old. The two younger females are 79 and 75 grams, and the older viper is 211 grams. 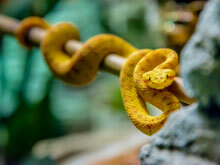 Zookeepers report that two of the eyelash vipers are relatively feisty, while the other is a bit shier. Eyelash vipers are primarily arboreal, meaning they spend most of their time in trees, shrubs and vines. The name “eyelash” refers to their elongated, pointed scales above the eyes, which look like eyelashes. The eyelashes “modify” the typical shape of the snake’s head, camouflaging the snake when it is hidden in dense vegetation. Eyelash vipers eat appropriately sized frozen/thawed mice for meals. Enrichment includes environmental changes, such as temperature fluctuations and humidity. Additionally, novel items are added to the exhibit, as zookeepers will change the propping in the exhibit and use different scents. Because the eyelash vipers are an arboreal species, be sure to look for them up in the branches of their new exhibit in the Aquatic and Reptile Center!